The Insta 228 transfer press has set the standard for quality and design in heat transfer presses. The machine features a swing away top heated plate, giving you full access to the working area for easy loading and laying up. Time and temperature is electronically controlled from the simple to use digital panel, which keeps you informed of your set working conditions. 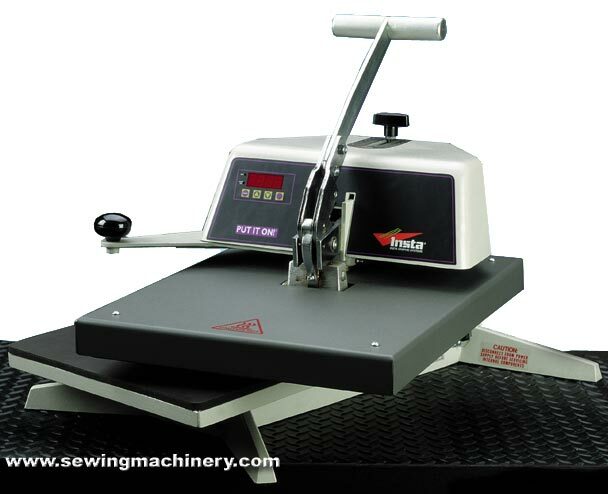 When you first see the Insta 228 it is immediately apparent this machine is robust and built to last. It is aimed at the professional market, with Insta being so confident of their technology and manufacturing process, that as well as the standard 12months industrial warranty, they also give you a lifetime warranty on the heating element. Temperature can be programmed to display either Fahrenheit or Centigrade. Pressure adjustment scale for ease of reading pressure. Lower cut-away base for placing t-shirts onto the platen. Fitted with standard 13amp plug.